Dave wrote: Buying a pin may not necessarily be the fix if the caliper itself is worn. The caliper may need a bushing in it. Tbh I used some strips of plastic bottle and put it in the caliper and the noise eased up a bit... I wud try using a strip of aluminum. I've had the same prob and used the aluminium (like from a coke can) and it reduced greatly. If u are trying eliminate rattle also check the shims for the brake pad. Over time it becomes loose and doesn't hold in the pads as tightly as it once did. Lol you guys just put yourselves in line for a caliper replacement. The best home made remedy without long term effects is silicone. Those calipers are so soft even plastic wears them. Also if you understand how a caliper works you also just restricted movement causing pads to wear unevenly. Dave wrote: Lol you guys just put yourselves in line for a caliper replacement. The best home made remedy without long term effects is silicone. Those calipers are so soft even plastic wears them. The same place u were putting the home made shims. The silicone with the left over grease will never harden but will act as more of a cushion for the pin that is slack. Alsam2415 wrote: hay guys in desperate need of some advise and help, I have a 2012 Galant fortis which gives off a high carbon scent when rpm reaches 3k. The secondary O2 is a sniffer and shouldn't be in direct exhaust fire. When condemning the cat you need to space this O2 away from the direct gases and you won't trigger any MIL lights. You can also write to the ECU and disable that O2 sensor. Anyone with 17's aftermarket rims on theirs? 17x7 (7.5) 225/50/17 or 215/50/17? The availability wider selection of good 17" tyres have me thinking of switching from the stock 16's. What offset? Not looking for fancy or anything like that. I used the tein street flex with the EDFC on my 2013 GT, to be honest with coilovers you get what you pay for. I bought these from the local dealer and he was a considerably cheaper than if I bought it in myself. The shock tube was independently adjustable so the piston stroke was not affected. There was no issue of rust or corrosion. Finally with the edfc if the family is the car I just hit the preset and the ride was nice soft and smooth, hit another preset and it’s play time. My advice don’t rush to buy. Take some time Save and get something good. Also decide if you really need coilovers or is it just a conversation piece. Finally if you decide on coilovers I strongly suggest you also get some front fender bars. 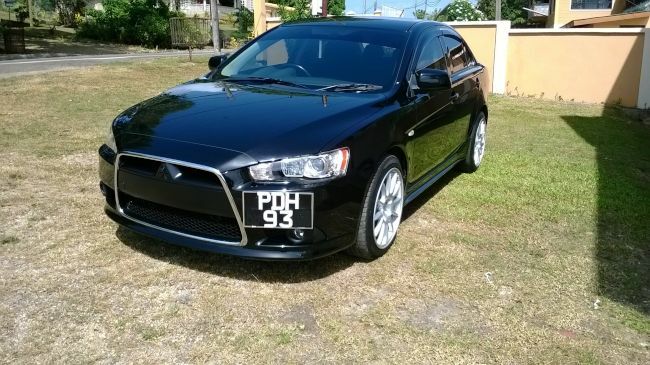 Rush wrote: Folks, after a 8 year hiatus or so, I think I'll be re-joining the lancer family. Had a CK4, then CS and am now looking at getting the CY from DM. Currently priced at 185. Their 7 year plan seems attractive if you out 40% down. From my calculations, it may be cheaper to go this route considering ur getting fully comp insurance. Not the route I'm going...but thought it would be good to share. Hoping that the lancer treats my family and I well, since I plan on treating it well. Hey if you have kids and use car seats I would look away from the lancer. The option for isofix or top tether anchors was not considered important for this family car. Be weary the salesman will tell you it is equipped. But when you are ready to install the child seat you will realize that it is absent. JUS4SHO wrote: Hey if you have kids and use car seats I would look away from the lancer. The option for isofix or top tether anchors was not considered important for this family car. Be weary the salesman will tell you it is equipped. But when you are ready to install the child seat you will realize that it is absent. You're right. No isofix nor top anchors. This together with the lack of Airbags is making us reconsider - just when we were about to pull the trigger. Other cars, like the corolla or civic come with 8/9 airbags. Maybe that's overkill, but all my 'googling' tells me that generally, the more airbags the better for the safety of those inside the car. I'm seeing second hand / new model corollas with fairly low mileage which seem to be pretty good cars. They're still pricey, even second hand. On face value it may make sense to add a few more and buy the lancer - but can't compare apples to oranges I guess. Sorry for the blasphemy and raising the "C-Word" (Corolla) in this thread - but that's my current logic. I'm quite disappointed tbh. The lancer has always been one of the sexiest cars imo. But, with two kids and using the car as a family driver - I may have to look elsewhere. ok fellers, last week my cy shut down at 6.30 am on the highway. The engine drive belt shredded out. A pathner of mine passing said he know some people and will get a belt at this hour. He carried the remains of the belt and came back with 2. While he was gone I started to loosen up the alternator bolts. The first belt was slightly big and the other one was slightly small and was pressure to put in. A man pass claiming to be a mechanic and forced the belt onto the pulley. After this he said his price was $500.00, and HE WAS SERIOUS. He said the company would charge me $1000.00 for this . What happen next was totally unexpected. My pathner take the old belt and start to beat the man. The man jump in in his car and lock himself in , in the haste he dropped his keys. I feeling sorry for the man and gave him $ 100.00. The boldface man said he wanted more money , well boy more belt he get. I gave the man he keys and he drove off shouting things. smart men who will look to dig out your eye. Last year I was driving when I saw a female friend of mine with her car on the side of the road and a man removing her battery. When I stopped and intervened he claim the battery was dead and he helping her by carrying it to get a new one just like that. He claimed he was an electrician. After cleaning the terminals, battery reinstalled the car started with no problems. All this time he was confrontational and abusive to me. At the end of this he demanded money ,,,can't remember the amount. Unknown to him and me although she was on the chubby side she knew some MMA and story was different. It seems that nobody helps any one again unless their is some money involved. Where would I be able to get the fan control relay and radiator fan relay for the CY4A? The dealer has none in stock, and when i showed the relays and asked the people at the 4 or 5 parts places I checked thus far they all watched them with eyes opened wide and said "Nah boy". dredman1 wrote: Where would I be able to get the fan control relay and radiator fan relay for the CY4A? A lot of things I notice DM dont have in stock, they will however do a ' rush delivery ' for a price to get it. If you desperate , a relay is just a relay, just buy one from those auto places to get your cy working. However these will not be able to fit up in the fuse box and may have to be mounted else where. rollingstock wrote: Anyone with 17's aftermarket rims on theirs? RS, my stock wheels were 16x6.5 rims with Dunlop SP Sport LM703 205/60/16 tyres and swapped out to 17x7 rims on Dunlop Direzza DZ102 225/45/17 tyres. No touching whatsoever. Even with KYB shocks and stock springs, the ride quality was not harsh by any means but the handling improved significantly. Thanks. I have a set of rims with 225/45/18 from the vr4. Think they may be too big. Anyone has the part # for the rear wheel bearing assembly for the cy2a? Is this the correct part#? rollingstock wrote: Is this the correct part#? That is the correct part number. I have one available if interested. Thanks but I already ordered a pair. I drove someone cy and this is the problem they are having.. Anytime the ABS operates (by hard braking on loose surfaces like sand ) the brake pedel sinks to the floor. Normal brakes is ok no issues. Fulid level is clean and ok , no leaks. kavaninho wrote: Just sharing some pics of the CY, not completed yet though. Hopefully, a set of coilover suspension in the future. Hey where u got ur gt bumper to buy?